The Colt Trooper® Patrol Carbine is a modernized, pro-quality Modern Sporting Rifle based on Colt's legendary M4 platform. It features a new Centurion Arms M-LOK® capable free-floated forend developed just for the Trooper®, and offers a great starting point for your next advanced carbine. 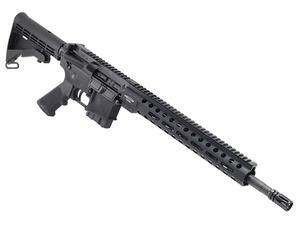 It's offered in 5.56 x 45 NATO, and features a 16.1” barrel and a 13” M-LOK® capable Centurion Arms forend with a Picatinny rail at 12 o’clock, and M-LOK® mounting slots at 3, 6, and 9 o’clock. It features a standard M4 buttstock and an A2 pistol grip, and comes with a 10 round magazine. Overall Length 32" to 35.5"